The big idea right now for solar and batteries is this: put solar panels on your roof, a battery in the backyard (or basement), and become utterly independent from the power grid, using free electricity from the sun. Batteries have long been looked to as a way to store energy solar energy during the day to be used at night, but they have long been too expensive to be used widely. But many companies are looking at 2015 as a very important year for the solar and battery partnership and I’ve heard the word “tipping point” being used repeatedly about this intersection recently. Why all the excitement and why now? First off, traditional lithium-ion batteries — the kind being widely used in cell phones and laptops — are becoming cheaper than ever before. Electric car company Tesla and Japanese battery giant Panasonic have been working closely on lowering costs of their lithium-ion batteries significantly, and with Tesla’s “gigafactory” the companies expect to be able to reduce the lithium-ion battery cost by another third. 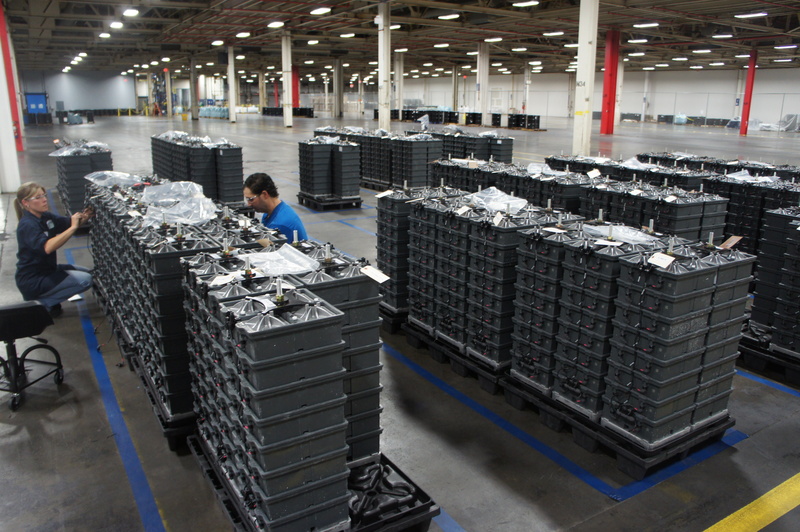 Navigant Research estimates that Tesla pays about $200 per kWh for its Panasonic battery cells today, and that price could drop as low as $130 per kWh by 2020 when Tesla’s massive factory — which is expected to more than double the world’s lithium-ion battery production — is fully up and running in Nevada. Several years ago, lithium-ion batteries cost closer to $1,000 per kWh. Tesla plans to sell some of the batteries from its factory into the power grid market, and SolarCity (the installer company chaired by Tesla CEO Elon Musk) already uses Tesla batteries for a solar panel energy storage system. Lithium ion batteries are becoming such a clear low cost platform for energy storage that other startups beyond Tesla are adopting this idea, too. At CES last week, a startup called Gogoro launched an electric scooter and battery swapping infrastructure based around modular lithium ion batteries designed also in conjunction with Panasonic. 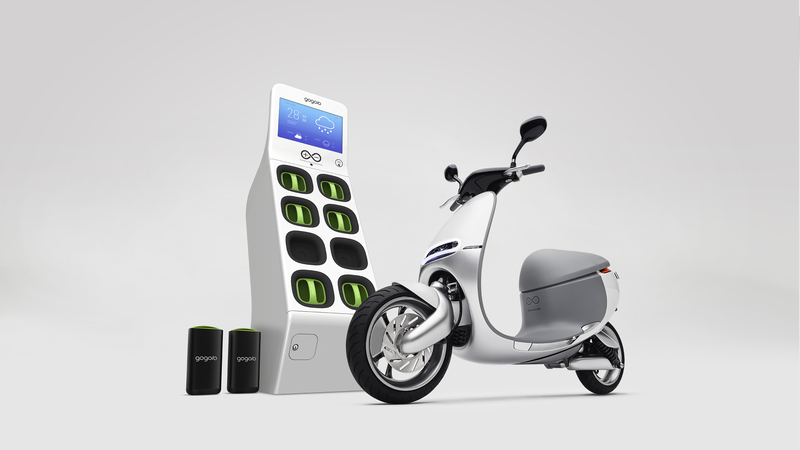 Owners of the Gogoro scooter will some day be able to swap out their two depleted batteries at a nearby battery swap station, and they will likely pay a subscription for access to the batteries. But it’s not just the economics of lithium ion batteries that are driving the pairing of solar and batteries. Other startups have been developing newer, low-cost battery chemistries that are optimized for the power grid, like Aquion Energy and Ambri. Aquion Energy last week announced that one of its largest battery installations to date (2 MWh) is going into a solar system on the Kona coast of Hawaii. The surge in solar panel installations is one of the main drivers behind this grid battery trend. There’s a lot bigger market these days for solar: More than a third of all new electricity installed in the U.S. in the first three quarters of 2014 came from solar panels, both utility-scale solar and solar panels on residential rooftops. That’s second only to new natural gas plants. Battery stacks and modules in Aquion Energy’s factory. Image courtesy of Katie Fehrenbacher, Gigaom. Solar companies, like SunPower, SolarCity, Sunrun and others, are doing deals with battery makers, looking to offer new services. Startup Stem, which uses distributed battery packs to work like virtual power plants, is working with Kyocera Solar. Then there’s the grid battery market that’s being opened up by the state of California’s aggressive mandates for energy storage. California utilities are being asked to buy 1,325 megawatts of energy storage services by 2020, and utility Southern California Edison has already said it will buy 250 MW of energy storage systems. Part of SCE’s plans will be made up by a huge 100 MW battery plant from AES Energy Storage and a 85 MW contract from Stem. Tesla’s image of its clean powered factory. Courtesy of Tesla. So clearly, utilities aren’t worried about energy storage in general, because they will some day be major users of this technology. But in the short term, some are worried about so-called grid defections. If your solar panels and battery offer you all the electricity options you need, why do you need the utility? However, according to a recent report from Moody’s, batteries and clean power are just still too expensive to be too threatening right now. Moody’s said that even with battery prices at $200 per kWh, and solar panels at $3.50 per watt, these technologies are “an order of magnitude too expensive to substitute for grid power.” Battery prices would have to be closer to $10 per kWh to $30 per kWh range to be cost competitive widely for the power grid, said Moody’s. Those costs might be difficult for (most) residential customers to justify, but it could be a different story for commercial building owners. GTM Research says the market for solar panels paired with batteries will surpass $1 billion in annual revenue by 2018 (up from just $42 million last year), with collectively 318 MW of solar and storage capacity installed in the U.S. by that time. One in ten new commercial solar customers will opt for an energy storage addition by 2018, predicts GTM Research. I’m thinking that batteries are economic now in places like Hawaii where traditional energy costs are quite high. Probably Australia too. Go for the islands, the businesses and the rural areas first. Then scale down to homeowners in higher rate areas. Then the broader grid. Moodys sounds rather too pessimistic. What’s the storage needs of a home with 8 kw of solar? 40 kwh at most? Maybe closer to 30 kwh? Combined with solar, that’s basically the cost of a system a few years ago. 10-30 dollars would make storage a negligable consideration. The tipping point is probably now for many markets and parity at 50-100 dollars once you match it up with solar system price declines of 8 percent per year. With the system of ‘Net Metring’ dependence on batteries for storage can be avoided. Under this system any building with a solar panel can supply the electricity into the grid while drawing from the same grid for it’s own consumption. At the end it is charged for the net power consumption. Rakesh, the whole point here is that “Net Metering” is public policy – capable of evaporating on fickle political opinion. Like in Hawaii, they’ve stopped allowing solar systems to be installed, because it’s getting too powerful. Big oil doesn’t like it. The only reason we even have net metering, is because oil doesn’t even take solar seriously yet. Once solar penetration passes maybe 3, 5% of homes, net metering will be gone. Then what? Can these systems power electric heat, or heat pumps, for an entire house? Joel, yes that’s why people do it. 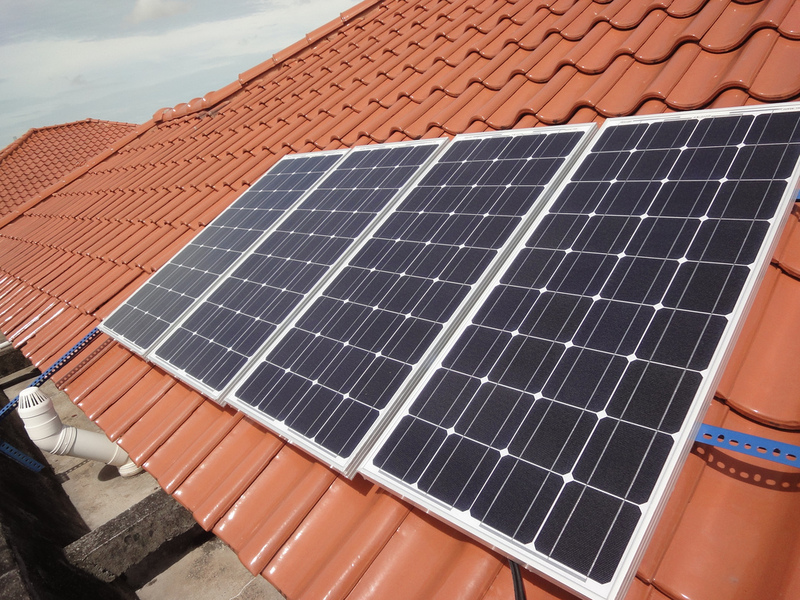 Electricity is much more versatile than water, and now PV is way cheaper than thermal. Go ahead and try to buy a battery from tesla, that would be about $15,000 with a core battery or almost 2 times as much without a core. Nissan’s leave is about $5,500 for a battery with a core and $10,000 without a core. Do you think that folks are willing to spend $10,000 to $30,000 on batteries. Are those folks willing to spend even more money on new charge controllers since the old charge controllers can not be used with Lithium ion batteries. Are those folks willing to spend more since Lithium ion batteries would have different voltages and new inverters would be needed. I bet folks would not spend that money to replace an existing system. They may not spend that much money not even to install a new system. But if you can make the size of the battery small, batteries may become affordable but there is a need to store the energy somehow besides batteries. What about heating a water tank while the sun is out where the water tank becomes your storage device. Or operating a air compressor when the sun is out and at night that could drive an air powered generator, where the air compressor tank turns into your storage device, Or pump water up a reservoir at day time, where the reservoir become your storage device to produce power at night with an generator. There are other ways to store energy besides a battery. An amateur Japanese housewife already successfully did this last year, completely took her house off grid and humorously surprised the TEPCO staff who came to her house and found no wiring connected to the external pole. Kudos to her, good job! I live in a Northern Pacific Island and use total Solar Power for 7 years now, Power storage is held in 32 6Volt deep cycle Batteries .I power all my applyances, refriderator, freezer, washing mashine water pump, tools , fans and all my lighting. it works for me. And it is below the local electricity cost of the local electric company. My biggest cost is Battery replacements. Including the batteries, is it still cheaper than the local electric company would charge? Residential Housing accounts for 27% of US energy industry market. Transportation 24% (down due to rising MPG’s) Live Smaller, I’ve learned that it’s not so much WHERE you live but who you live with (living with yourself is the biggest challenge) Smaller homes are just fine. What will make a difference is the advancements in construction of homes and an paradigm shift in what is needed as a home. passive solar SIP (Structural Insulated Panels) homes with radiant heat and cooling, solar thermal heat and hot water, absorption and geo-loop cooling, home waste digesters (biogas for cooking and fuel cell electric) can and are more practical in reducing “off sight” powers purchases of all kinds. Home fuel cells (See TOYOTA Patent Free Announcement) can turn every NG supplied home into an efficient Electrical plant on a distributed electric production grid ensuring grid security and reducing infrastructure needs and line losses. There already exists the technology to solve the many issues with grid tie solar… as we have seen in Hawaii and Germany the grid has become destabilised by large amounts of solar and wind power. What is required is a battery back up that can also be grid tied and able to respond to fluctuations in the grids power using demand response technology. The man that created the first grid tie inverter has invented and is now selling systems that actually help to stabilize the grid. The company is called Heart Transverter and is based in Costa Rica. I’d be happy to share information on this to anyone who is interested. With electricity seeming to cost more every month (I get constant letters from SCE here in So. Cal on proposed rate increases) it will not be long until the utilities will bring parity upon themselves, regardless to the solar power systems. That’s fine if you’re in the middle of nowhere, batteries are cheaper than miles of power lines. But if you have electric service it’s cheaper to tie your system into the grid drawing from the grid at night or at times of high demand. When your production is greater than your personal needs the excess goes back to the grid causing your electric meter to run “backwards”, thus you get paid for the production you don’t use. The problem with your (otherwise excellent) plan is the “greed” of the “grid” owners. They buy your solar-generated electricity at about half the rate of your baseline electricity (and if you consume more than the baseline, they’ll charge you much higher rates, for tier 2, tier 3 etc…). That’s a real twist of the common advise “buy low, sell high”! Although there is re-urbanization in the US, there are a large amount of exurban development which requires expensive new grid, and solar service is ideal for these people. Of course, the grid is essential to America’s security, and everyone should be required to pay for its good repair. Everyone that is on the grid has been paying paying for repairs for the last 100 years every time they get a monthly bill and pay it. Look at the itemized bill where it says maintenance fee or hook up fee etc etc. To go solar one must learn how to conserve electricity first. Today we waste so much and a lot of it we don’t even realize we are doing it. Improvement in refrigeration and other high end users are on of the first. At today’s electric rates it is over 10 years to recover costs, but with lower system costs it is coming within range if we can contain our usage. “Is the solar panel & battery combo ready to change energy markets?” No. LENR++ is going to blow solar, wind, fossil fuels, and every other energy source out of the water. Nuclear power is uninsurable. In the 1950’s, the nuclear bsiness would have died in its infancy, because no insuror would touch it. Congress made a law backstopping the industry with government money. For this reason, commercial insurors do not pay claims for damage caused by nuclear accidents. Read your insurance policy. Your insuror doesn’t have to pay. The sucker taxpayer does. You mean the technology that is “just around the corner”, and has been for the past 30 years? When it’s actually viable and available, let us know. Until then, are you suggesting that everyone should just continue using fossil fuels? How has that waiting game worked out so far? When it is time for an upgrade, you do so with the best technology available at the time, while trying to foresee what the next big thing might be so that you can plan to incorporate it into your design later. The use of a technology drives acceptance of that technology, which drives advancement in that technology, which drives the use of that technology. Sticking with 100-year old ideas while sitting around waiting for tomorrow’s breakthrough does nothing to bring that breakthrough any closer. 99c/W solar panels were being advertised on TV in Perth, Western Australia by Solargain last week. That is a lot cheaper than the $3.50 you talk about in your article. 99 Australian cents are worth about 82 US cents. Uh? Bare panels, uninstalled, low conversion % (requiring more panels) is not the same as installed price for a system that actually does something. Comparing apples and oranges. The reason the panels cost $3.50 and not 99 cents per watt is that you have to install them. The difference is the installation. You need to look at the overall cost of ownership, which includes, yes, installation, and also maintenance, monitoring, and insurance. You’d need an inverter or a battery to store the power as well. Anyone can buy a cheap solar panel, but to get electricity (what you actually use) you need a lot more than just a cheap panel. You missed one thing about the Moody’s report: they assumed that people would have to buy enough storage to retain 30 days of power use. This is a ridiculous assumption that massively inflates the true costs. 30 days for perhaps Alaska. Most people max in the US would want a week just for emergencies like a tornado or hurricane weather knocking off the power grid. With the batteries filled the excess goes to the grid and people get paid for that. May take a few years longer for the solar battery to get paid back but it would eventually happen. plus a ton of people would be thinking where I live each year there are a number of days without power so having this battery backup would be a godsend. We have been off grid for thirty years. I just recently replaced my system. We do have a generator fire back up, but when the batteries are low, we simply delay using using power. Vacuuming, washing clothes, pumping water can wait a day or two until the Sun returns. Navigant has stated that Tesla is paying Panasonic $180/kWh for batteries. Utility scale solar was $1.81/watt during Q3, 2014. EOS Energy Storage is grid testing their zinc-air batteries. They claim $160/kWh and 10,000 cycles which makes the price $0.016/kWh (plus siting costs and profits). Moving <4 cent wind or solar for ~2 cents is incredibly competitive power. (I suspect the $10 to $30 Moody price assumes far shorter cycle life. Those Navigant numbers are stated from Sam Jaffe about a week ago re that post I linked to. It’s just supposed to be a realistic range. There’s different prices for utility scale, commercial deals and residential solar roofs, so the most applicable number for this purpose (or seeing if solar/batteries would threaten grid defection) isn’t utility deal numbers, but either commercial or residential prices. TESLA/Solar City has already stated that every Solar City customer would get battery backup in the next 5-10 years in an article published last year. 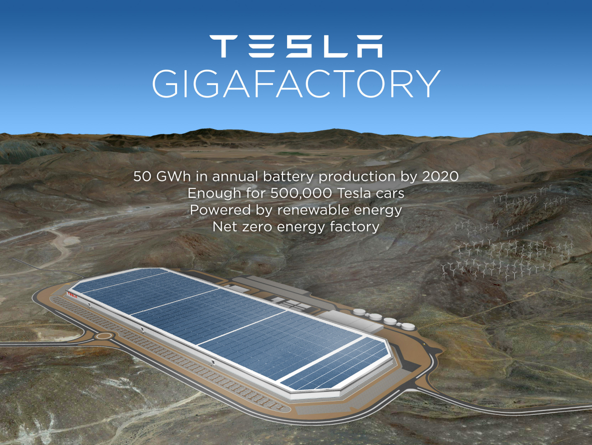 This coincides with the volume production of stationary storage expected to be made by the Gigafactory. Enphase is also on the heels of a major announcement that ties into their MicroInverters to offer battery backup. For the upper 30% of most households this is the beginning of the end for electrical utilities and they know it. Under the current net metering rules/regulations I cannot transfer my $1000.00 utility credit with SCE from solar to another property in my family who can wisely make use of it. My solar totally offsets my household but not for them. Work with me or lose me altogether. I am researching the ability to go totally off grid. It’s not even about the money at this point, its the principal. I would rather give it away with a Level2 60A EVSE in my driveway then give it back to SCE! The Moody’s study assumes you need two months of storage to maintain grid-like reliability. That seems like an absurd amount of overkill. Solar PV systems are already at less than $2.30 per watt after applying the ITC and traditional L.A. battery systems are already less than $166 per kWh and solar plus storage still doesn’t pencil out economically. So I agree with Moody’s study.